Because dental accidents can happen at any moment, most dentists reserve time in their schedules for emergency dental visits. 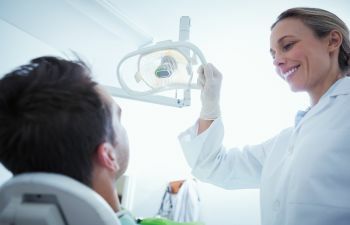 Though some emergencies require immediate attention in order to preserve an injured tooth, others can be managed effectively when the right steps are followed. Consider the following scenario—a young boy is playing flag football when another player accidentally hits him in the mouth. Shocked and in pain, the boy realizes that his tooth has been knocked out. At this point, it is critical for the boy to try to locate the tooth. He should pick the tooth up by the top (crown) portion, making sure not to touch the root. Next, he should gently rinse the tooth if possible, and carefully place the tooth back in the socket. While the tooth is in the socket, the boy can bite down carefully to hold it in place. After following these steps, he should call his dentist! Given the same circumstance above, imagine that the young boy’s tooth was knocked loose or out of alignment. Again, this is considered a dental emergency, yet there are a few things to do in the meantime. First, the boy can attempt to put the tooth back in its original position using very light and gentle pressure. Once the tooth is in position, he can bite down to keep the tooth from moving. When it comes to chipped, cracked or fractured teeth, there are instances that require immediate dental care and some that do not. In essence, if a tooth is chipped and does not hurt, it’s important to contact a dentist. Yet, it is usually okay to wait a few days for an appointment. On the other hand, a cracked or fractured tooth is serious, as it typically means that a tooth has suffered internal damage. After calling the dentist to schedule an emergency visit, dentists suggest rinsing with warm water. If swelling is present, an individual may apply a cold compress or ice pack. It’s also a good idea to take a pain reliever (acetaminophen). Given the discussion above, perhaps you feel more equipped to manage a dental emergency. Even so, if you’re still wondering what constitutes a true dental emergency, Your Dentistry Guide provides the following explanation—basically, any dental problem that requires immediate treatment in order to save a tooth, stop ongoing tissue bleeding or alleviate severe pain is considered a dental emergency. At Alora Dentistry in Napa Valley, patients trust our team for prompt, superior dental care when they have an emergency. With special times reserved in our daily schedules and extended hours on weekdays and Saturdays, we go to great lengths to alleviate your fears and preserve your smile. For help with your dental emergency, call Alora Dentistry today!